Before I get to my delicious new salad recipe, I wanted to share an article that caught my attention yesterday titled “My Gluten Free Diet Disaster“. A woman who’s daughter is diagnosed with an allergy to gluten decides to go gluten-free along with her daughter and realizes that many (if not most) gluten-free foods sold in stores are highly processed and less healthy than their counterparts. She ends up deciding to go off the gluten-free diet, mainly because she doesn’t need to be on it! She decides that her body can get more nutrients if she is not gluten-free. My Dad happens to be one of the few people who have Celiac Disease (many people are diagnosed with varying levels of gluten intolerance, but few people actually have Celiac disease). Therefore, he has to be on a gluten-free diet or his body won’t absorb nutrients and function properly. One of my biggest pet peeves these days is when people decide to go on gluten-free diet when they don’t need to be on one. It’s beginning to become a diet fad and because of that, everyday people are starting to see the “gluten-free” label at the grocery store synonomous to “fat-free” or “low-carb”. Most gluten-free foods are in fact higher in calories and have less nutrients. They are meant for people who can’t tolerate gluten, not for people trying to diet! And trust me, they don’t taste better – I’ve sampled quite a few of my Dad’s gluten-free foods. My Mom is always buying new things for him to try, but it’s rare to find gluten-free foods (especially baked goods) with the same texture and taste as their gluten counterparts. This is not to say that someone without gluten intolerance can’t eat a healthy gluten-free diet, but many people have the wrong idea about gluten-free foods. 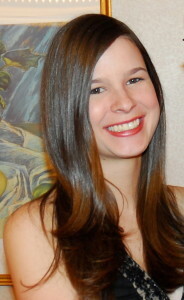 I thought this article presented a good perspective on the gluten-free diet. If you have celiac or suffer from gluten intolerance, my heart goes out to you! I know my Dad would love to be able to go to Italy and eat his heart out if he could, but he can’t. I hope and pray everyday that I don’t end up getting Celiac (it’s genetic). Until then, I’ll continue eating an extra slice of pizza for my Dad! Moving onto my latest recipe (which happens to be gluten-free)! Brussels sprouts were one of those vegetables I never would have thought of ever trying, and when I did, I loved them. At first, I would only eat them shredded and sauteeed with lots of spices. After a while, I mustered up the courage to try them roasted in a few different ways and ended up loving those too. One way I never thought I would eat them is raw. Last week, I surprised myself. I think I can now say I love brussels sprouts in every form! The idea for this salad spurred from a salad that Luke and I ate when we went out to dinner a couple of weeks ago. We had a salad made of raw brussels sprout petals and we both really like it. My original intent was to do the same thing with this salad, but as I started researching recipes for raw brussels sprouts online, I decided I’d rather do a shredded salad first. It turned out fabulous! I chose to pair it with a lemon vinaigrette because we had a lot of lemons and as it’s the start of the summer season, it seemed fitting. I think the salad would work great with other dressings too. The cheese and dried berries are a must for me, and the walnuts really add some nice flavor and crunch too. Besides the chopping of the brussels sprouts (which I almost always enlist Luke to do), this salad is a pretty easy dish to whip up! First, peel off the outer leaves of the brussels sprouts and chop off the stems. 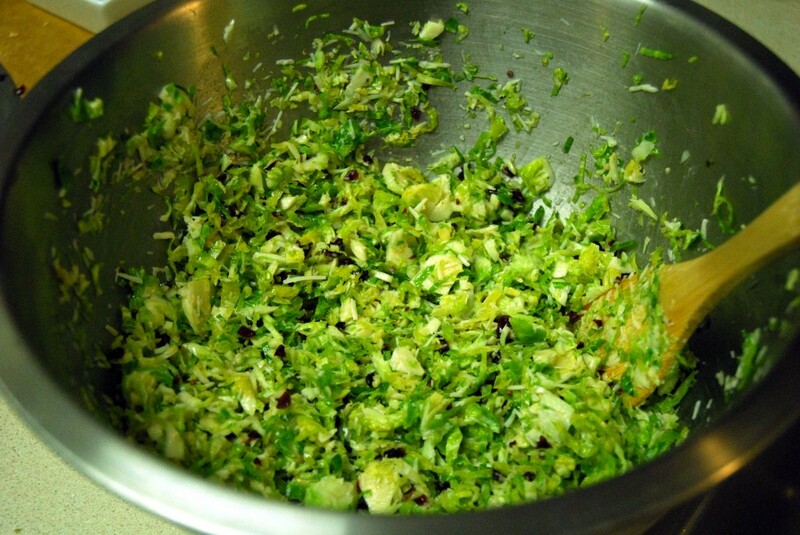 Then shred the brussels sprouts by finely chopping them or using a mandolin. Then mix all of the vinaigrette ingredients together in a mason jar, seal it, and shake shake shake! Serves 4 (as a side). 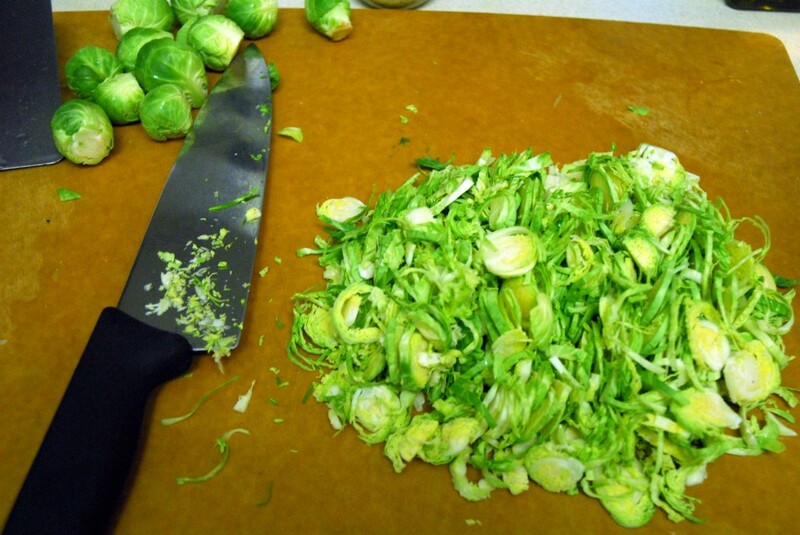 Peel off the outer leaves of the brussels sprouts and chop off the stems. Finely chop the brussels sprouts so that they are shredded. You could use a mandolin for this as well. 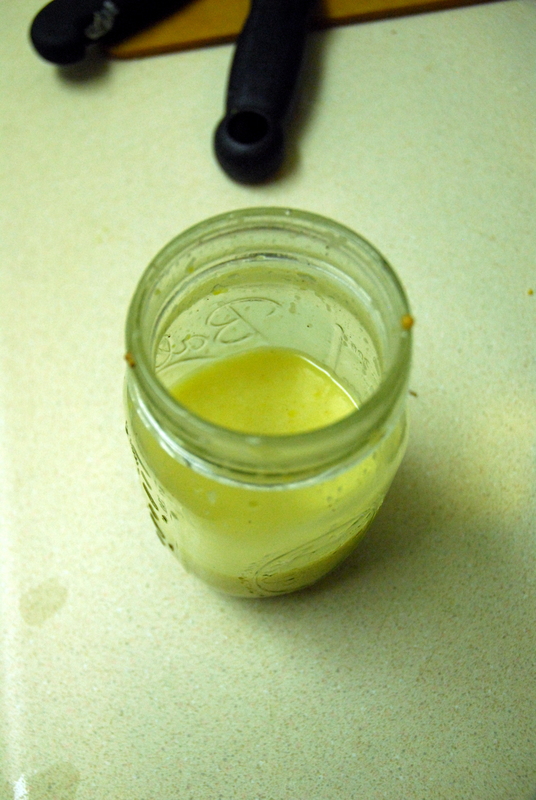 Make the lemon vinaigrette by combining the lemon juice, minced garlic, olive oil, mustard, agave nectar and salt and pepper in a mason jar (or whatever you are going to keep the dressing in – you will have extra). Close the jar and give it a good shake. 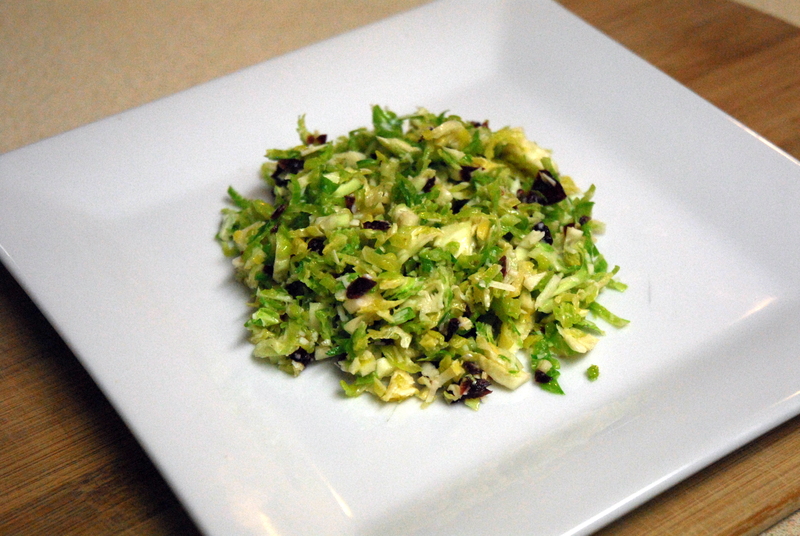 Put the shredded brussels sprouts into a salad bowl and pour about 5 tbsp of the vinaigrette over the brussels sprouts. Then add the grated parmesan and dried cranberries. Garnish with toasted chopped walnuts (optional) and enjoy! 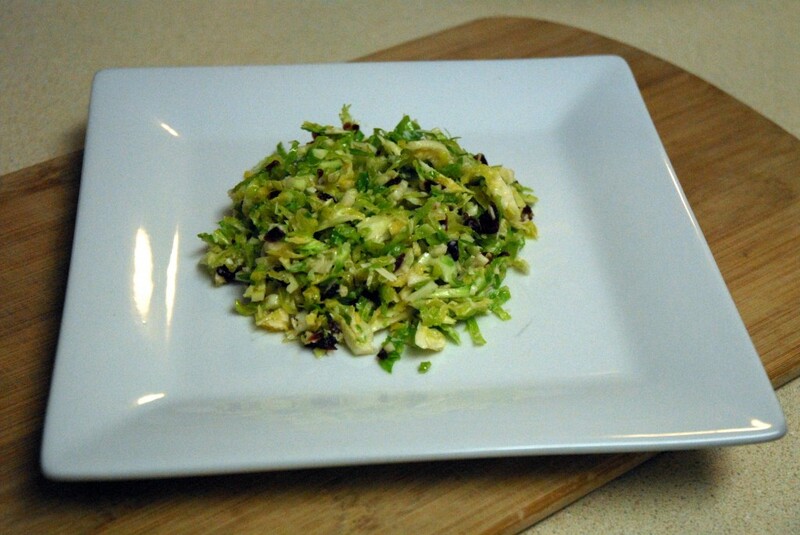 This entry was posted in Brussels Sprouts, Gluten-free, Recipes, Sides, Vegetarian and tagged brussels sprouts, celiac, gluten-free, lemon, salad. Bookmark the permalink. I totally agree! I think people claim to be gluten free because they think it’s healthier? You can be extremely healthy on a gluten free diet, but that’s not the case with most people. Yes – way too many people think that gluten-free is the latest way to diet. Some companies are even trying to take advantage and market their gluten-free products as such, which just perpetuates the whole situation! It’s great that gluten-free products are more readily available these days for people like my Dad, but not when they’re being marketed as diet foods! I personally don’t see the point of going gluten free without a Celiac’s diagnosis. Your title hit it on the head – it’s a “fad” for people without a legitimate health reason; an excuse to avoid most carbs. But is it healthier in the long run? Doubtful. It’s great to see the woman acknowledge it and adjust her diet. Yeah I just hope the fad fades quickly! P.S. I actually wrote a post awhile back about eating things that are naturally gluten-free versus focusing on gluten-free substitutions! Just read your post, love it and agree! My Mom has probably bought countless expensive snacks that my Dad doesn’t like. It’s really rough to find good alternatives. But things like quinoa? Amazing! And I love your approach to explaining your GF diet to other people. This salad looks amazing!!! YUM! I agree with you on the gluten free thing. So many people want to be on it just cause they think it’s healthier. Sometimes the “fads” really get to me! I used to hate on Brussels sprouts with a passion, and now I count them among my favorite vegetables! My favorite way to prepare them is by simply roasting them with olive oil, salt and pepper until tender. So simple and delicious. BUT, I tried a Brussels sprouts salad at a restaurant a few months ago that I absolutely LOVED, and think that I might now enjoy them most raw. Your salad sounds delicious; I might actually try making it this weekend! I completely agree with you about the gluten-free fad. Most of the foods marketed as GF are highly processed substitutes for their gluten-containing counterparts. I have a gluten intolerance, but never buy these products because a) they don’t taste good and b) there are so many delicious naturally gluten-free foods to be enjoyed. I don’t feel deprived at all! It’s unfortunate that many consumers associate the GF label with “healthy.” Companies are taking advantage of people’s naive and profiting off of it. It makes me so upset! Yum! This recipe looks so good! Funny that you mentioned how eating “gluten free” is becoming a fad; my dad and and I just talked about how everyone seems to be eating gluten free, or at least talking about it. Thanks! Yes it’s really becoming a “in” thing to do and most people don’t know much about it or why they are doing it! I SO agree. I first heard about gluten free diets because of the trend that people think a gluten-free/casein-free diet can cure autism. A conversation I don’t even want to get into. Anyway, I started searching about it and found out about celiacs. Since then I have met so few people with celiac, and so MANY people on gf diets. I don’t know why it pisses me off. I have friends that have gluten intolerance and they cheat all the time and to my awareness, do not have “flare ups” so I just don’t get it. I do have friends that are on this diet because doctors told them they had intolerances, just not the gene for celiacs. To each his own with the diets, but I don’t like the ignorance it breeds for those that DON”T research before they choose. Cristina chose to go gluten free because of valid reasons. But the general public will start associating it like they do with the “low carb” fad; they will go eat a fatty steak for dinner but won’t have brown rice, or a small amount of whole wheat pasta. Bacon – bring it on! Whole grain toast, no thanks. You said it perfectly, Caroline – it shouldn’t be associated with low fat or low calorie. That’s my rant, good night!